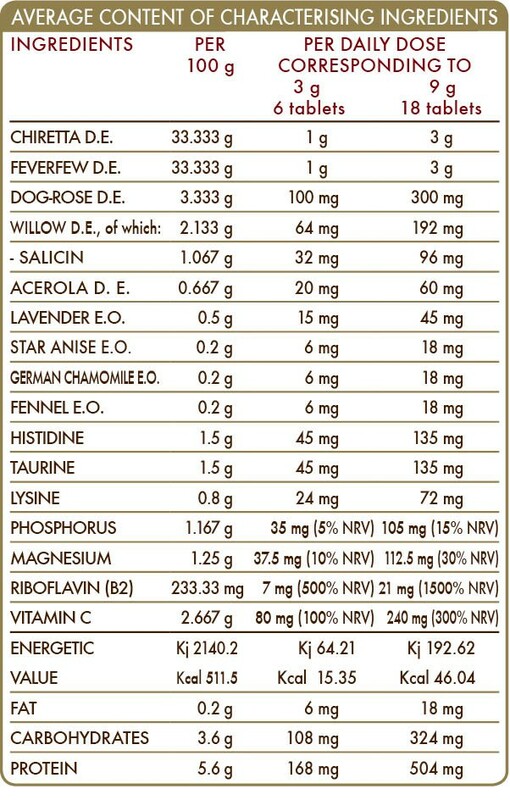 Herbal supplement with vitamins, minerals and other nutrients. Feverfew and willow counteract localised stiffness and promote proper joint functioning. Chiretta stimulates the respiratory tract function and, in association with vitamin C, improves the body's natural defences. Vitamin B2 contributes to a normally functioning nervous system. Chiretta (Andrographis Paniculata) top D.E. (titrated to 30% in andrographolides), feverfew or chrysanthemum parthenium (Tanacetum parthenium) flowered herb D.E. (titrated to 0.8% in parthenolide), magnesium glycerophosphate, microcrystalline cellulose°, gum arabic°, dog-rose (Rosa canina) fruit D.E. (titrated to 70% in vitamin C), white willow (Salix alba) bark D.E. (titrated to 50% in salicin), (L-)histidine, taurine, silicon dioxide°°, (L-)lysine, acerola (Malpighia glabra) fruit D.E. (titrated to 50% in vitamin C), magnesium oxide, lavender (Lavandula latifolia) flower E.O., plant-based magnesium stearate°°, vitamin B2 (riboflavin), star anise (Illicium verum) fruit E.O., German chamomile (Matricaria chamomilla) flower head E.O., fennel (Foeniculum vulgare) fruit E.O. We recommend that you take 6 tablets (3 g) one to three times a day at any time (6 to 18 tablets a day).